Last March (2013), while listening to Kai Ryssdal on Marketplace, I heard a phrase coined that, should the government mess get worse, might stick. 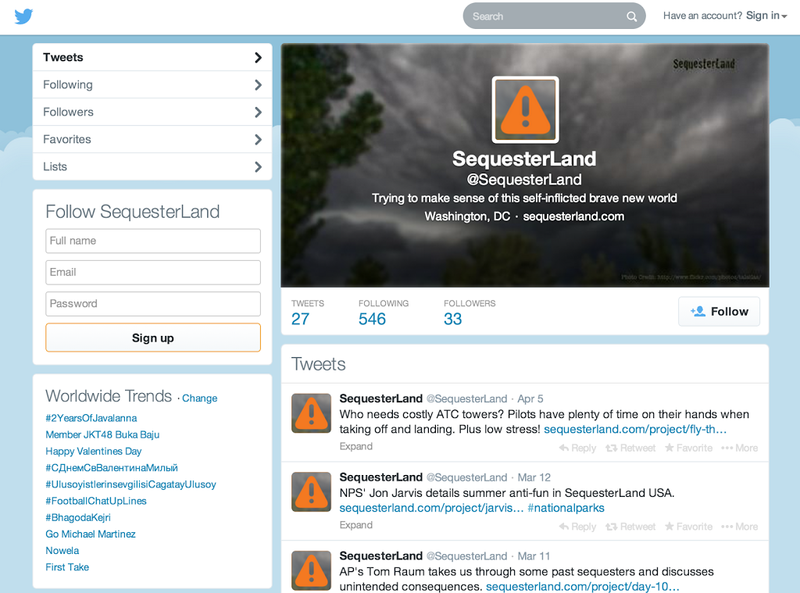 SequesterLand. 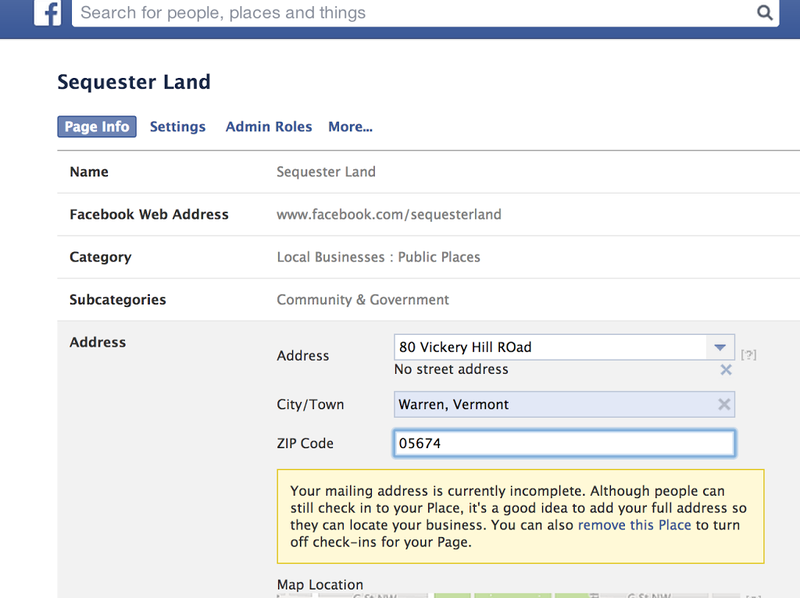 I pulled over, hopped on Hover.com and bought it: sequesterland.com. 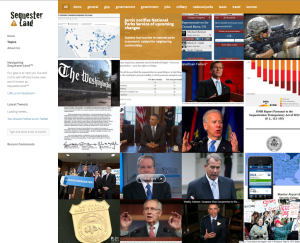 That night, I spent 2 hours setting up a simple WordPress website on one of our Rackspace servers, setup a simple image-centric theme and started scanning the web for pertinent information about the looming debt/budget/government crisis known as a sequester. My ‘pages’ were going to include photos, videos and news stories about the sequester and hopefully drive some referral and organic traffic, as well as some discussion about the mess our government was in. I created Google Analytics, Facebook & Twitter accounts, started posting content and following the ‘players’ in our new sequesterland. Well, the sequester happened, we are technically living in ‘sequesterland’ as I type this and things haven’t changed that much. I’m sure no one is hearing from thousands who lost their contracts, jobs, healthcare, etc, but the site has run its course and is no longer pertinent. Now comes the fun part. No since keeping up a site that no one is looking at and isn’t worth the time editing. So, we take the steps to clean everything up, but maintain any positive love captured from linkage, indexing, etc. 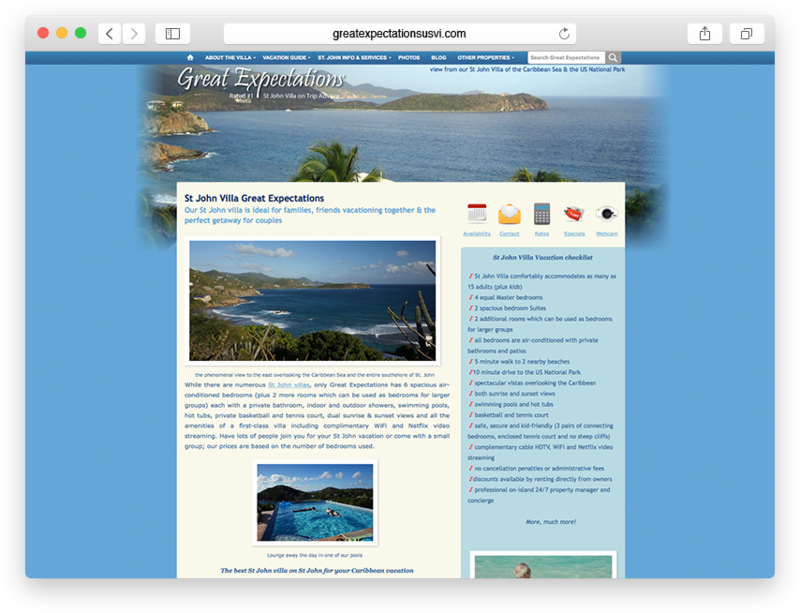 We have dozens of pages indexed by search engines and maybe even linked from other websites. Let’s properly redirect any love we may have back somewhere at least remotely pertinent: this blog post! So, we first prepare our blog.vickeryhill.com page (this one! ), publish it and grab the URL. 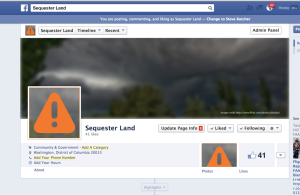 This is the page where we want ALL the pages on Sequesterland.com to point to. Down near the bottom is a “Merge Pages” section. Click Edit. 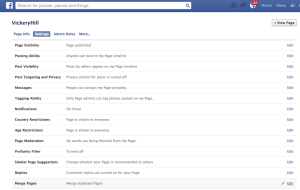 We are taken to the Request to Merge Duplicate Pages section of Facebook. 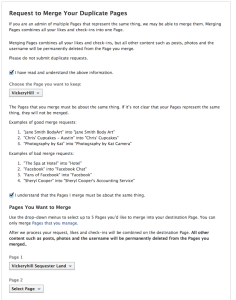 Read the instructions, check the “read and understand” boxes and select your pages for merging. Note: Choose the page you want to KEEP in the first section, then choose the page (or pages) you want to Merge into the Keeper in the second section. After double-checking our work, we press the ‘send’ button and are awarded with a lightbox notification. What to do with Twitter? 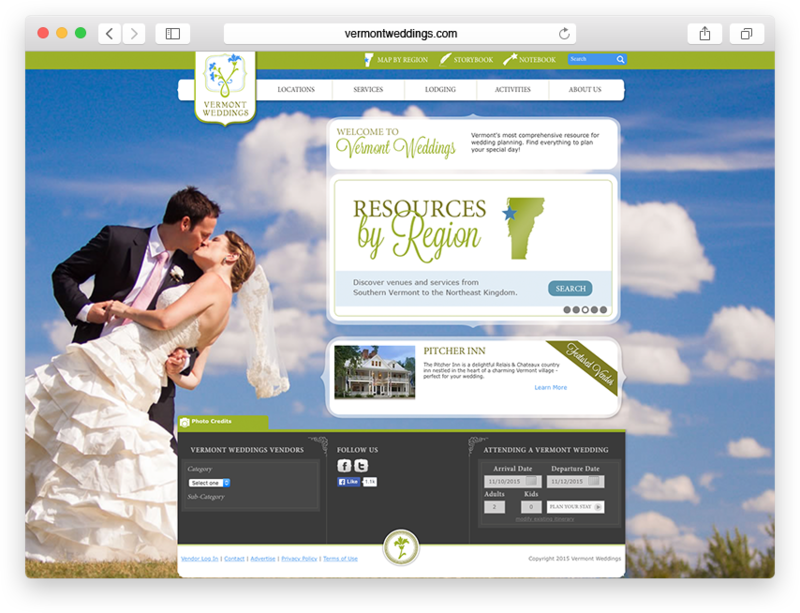 So, the domain is renewed for one more year (March 2015) and all traffic is redirected. We turned off auto-renew and will just let it expire. Any juice the search engines had and any linkage from elsewhere has been redirected via our 301s. We setup a simple alert in Google Analytics for this site (blog.vickeryhill.com) to let us know if any traffic comes into this page.